Corporate Fly Fishing Days in Somerset, Devon, Dorset & Wiltshire. With our corporate fly fishing days you can offer your clients or staff a day out with a difference. 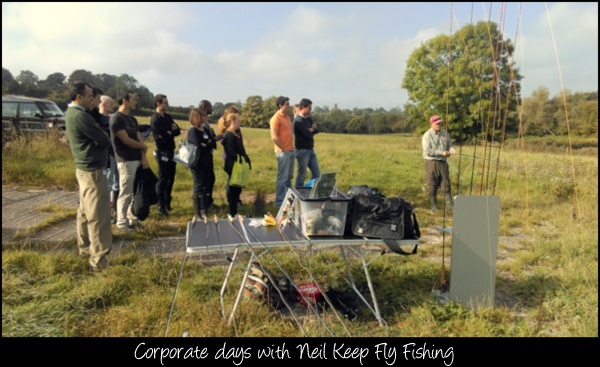 Neil Keep fly fishing can organise corporate fly fishing days in Somerset, Wiltshire, Devon or Dorset. All of Neil’s corporate fly fishing day events, include the fly fishing tuition, fishing permits, catering and any other particular requirements you may have. Neil Keep fly fishing can cater for any group size. Larger group days will be ran with additional instructors that Neil personally knows and tries to keep a ratio of 1 instructor to 4 clients.